Your resource for understanding the rapidly changing landscape of urban mobility. New mobility services such as shared scooters, bikes, and cars are rapidly expanding in cities. Without collaboration between the public and private sector and access to data, it is unclear whether or not these services expand access to transportation for traditionally underserved communities - or whether they are being left out. This report summarizes key methods Populus developed to support ongoing equity analysis by the District Department of Transportation (DDOT) in Washington, D.C. for their dockless bike and scooter program. Developed by transportation PhDs from UC Berkeley and MIT, the Populus platform helps cities access real-time data from mobility operators for monitoring, evaluating, and transportation planning. Populus’ advanced analytics software integrates real-time data feeds from every major operator in a user-friendly platform to help cities monitor shared mobility services, including bikes, scooters, and vehicles. City planners can log into a single dashboard to gain real-time insights on how many scooters, bikes, or vehicles are in operation, manage incidents, and make data-driven mobility policy and planning decisions. Set more flexible caps for your dockless bike/scooter program, or harness data to identify new infrastructure needs. Our data on the adoption and use of mobility services, including ride-hailing (i.e. Uber/ Lyft), bikeshare, and scooters is the most current and comprehensive data on urban mobility trends. Developed with the goal of helping researchers, planners, and policymakers gain insight into how mobility services shape the future of cities, the Populus Data Grant Program is a unique opportunity for the transportation community to conduct innovative research with access to the best data available. 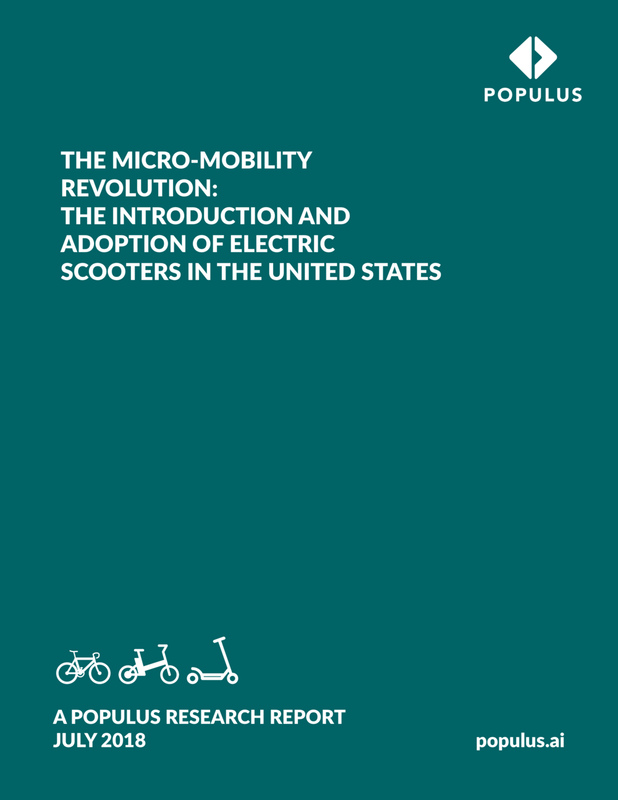 The Populus 2018 study on micro-mobility presents new data and insights on the adoption, perceptions, and use of new services such as bikeshare, dockless bikeshare, and electric scooters based on primary data gathered through our platform May to July 2018. The study finds that a majority of people in U.S. cities have a strong positive view of these services, and a somewhat large portion of people have used them, despite their recent introduction to the mobility ecosystem.